Welcome to Polarity Shift, where an editor chooses a game they love and tries their damndest to give it a negative review. Only by seeing how the other half lives can we truly reach a sort of opinionated paradise. I, as nothing but a participant in the end user experience of Fez, am in an unenviable position. There is no game in Fez that feels separate from the suffocating influence of its design — which is mainly a fancy way of saying that playing Fez is basically like playing B-roll in a documentary about Fez. To enjoy it, you must enjoy its creator, Phil Fish, and you must enjoy the all-important story of How It Came To Be. This makes Fez‘s reputation close to the greatest trick ever pulled. Here we have a game built as a love letter to its grandfathers, but operating by none of their rules; a kind of video game mood piece that’s just a little too scared to be full-on Dear Esther abstraction, and instead buries itself in precious metafictional puzzle solving. It’s a shame, because with either half viewed in a vacuum, the game feels complete. Maybe not an all-time great, or a work of unimaginable importance, but either a solid, clever puzzle game or breezy, SNES-inspired atmospheric roller coaster. Combining the two without any added perspective makes the whole thing feel a lot cheaper. Early on, protagonist Gomez receives (you guessed it) a fez that allows him to see his previously 2D world for thxe simplistic, blocky 3D landscape it actually is. For the player, this translates to the ability to view each scene from four different perspective. Whichever 2D plane you’ve focused on is the geometrically “correct” one, allowing for impossible maneuvers due to the perspective shift. It’s a neat trick, but Fez fails to capitalize on it in any meaningful or varied way. Most of the 32 cubes required to reach the game’s first ending can be obtained with minimal difficulty — you generally just hit the triggers to line up simple paths and follow them. It’s here that Fez‘s mechanical simplicity really shoots itself in the foot. At the point the perspective switching becomes busywork, the real busywork is showcased: moving, and jumping about. 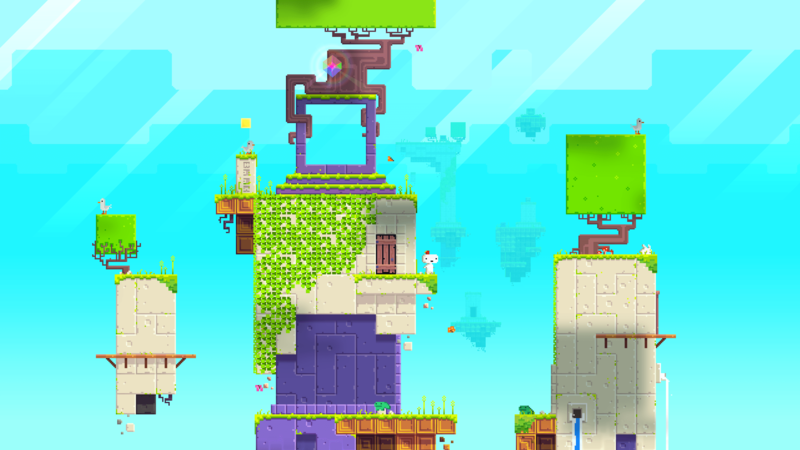 Fez‘s platforming is sluggish, with an underwhelming jump and interminably slow climbing controls. If you die, the game just starts you seconds before your demise, which is probably a good idea given the alternative. The best alternative, though, would be to rely just a little less on its central gimmick, and actually design a character that’s fun to move around. The real star of the show, then, would be Fez‘s optional “anti-cubes.” Trading a yellow palette for blue, these cubes are, by design, far trickier to obtain. Surely, then, these challenges would make better use of the central, unique mechanic? Well, sometimes. There are a few honest-to-god, insular rotational puzzles in Fez that are satisfying to complete. But far more of the anti-cubes are locked behind cutesy, fourth wall-breaking codes that make Fez‘s world feel flatter than it should. It’s a tricky thing to sell this specific kind of meta element in a realized fantasy world, and Fez makes practically no effort. You will decode a language paying attention to some conspicuous animals. You will transcribe obtuse markings into button combinations. In the most egregious example, you will find a QR code plastered on a wall. These tricks are, like the perspective shifting, neat, but they’re also destructive. Every location, grounded with loving art design, is reduced to a scavenger hunt for binary codes and hints. It’s impossible to get lost in the world of Fez when it so insecurely reminds you that it’s a video game. It would be one thing if that distance were used to heighten the game’s aesthetic feel, like staring at a particularly beautiful watercolor painting. Instead, the distance exists only to remind the player that Fez is not a world that exists to be explored. It is a world that exists to be solved. Fez wants you to think it’s The Little Prince, but it’s actually just a Where’s Waldo? book. This is the conflict that destroys Fez. It’s not indecisive — it’s just made a decision to be incongruous. The aesthetics deserve a game less cheekily focused on contextless puzzle-solving; the puzzles deserve a game that demands less coherence to succeed. In trying to have it both ways, Fez becomes the rare game that amounts to less than the sum of its parts. The result is as if a malevolent force had cursed a pair of 3D glasses. Close your left eye and you’ll see a picture; close your right eye, you’ll see another. The catch? Either is preferable to having both eyes wide open.